Here's a Crotale Sound for HALion SE 3. You get 2 Octaves from C6 - C8. Each crotale can be tuned independently. It's my first time trying to pack one of these to share, so hopefully it will work. 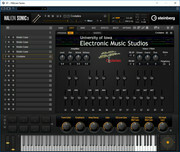 Simply download it then double click the vstsound file once you get it. It should then open your "Steinberg Library Manager" where you can choose how and where on your system to install it.